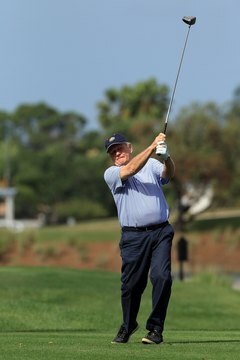 Golf great Jack Nicklaus tees off at a 2012 pro-am event. Jack Nicklaus is undoubtedly one of the greatest golfers in history. From 1962 through 2003 he won 73 PGA Tour events plus 10 tournaments on the Senior PGA Tour, which is now called the Champions Tour. His website also credits him with victories in 35 “unofficial or international events.” Nicklaus won 18 major professional tournaments, plus two U.S. Amateur championships and eight Senior Tour majors. He suffered a rare slump in 1979, but bounced back strongly in 1980. Nicklaus enjoyed a strong 1978 season, winning three PGA Tour events plus the British and Australian Opens, and was named Sports Illustrated’s "Sportsman of the Year." At that point, Nicklaus had played the tour for 17 years, from 1962 through 1978, winning at least two tour events each year and twice winning seven times. In 1979, however, he didn’t win a single tour event. He earned a career-low $59,434 while playing in 12 PGA tournaments, and his scoring average of 72.49 was more than one whole stroke higher than it had ever been. At age 40, Nicklaus hadn’t won a tournament in 23 months – since July 1978 – when he teed off at New Jersey’s Baltusrol Golf Club to begin the 1980 U.S. Open. He quickly shot to the front, sharing the first round lead with Tom Weiskopf with an Open-record round of 63 despite missing a 3-foot putt on the 18th hole. Nicklaus followed with rounds of 71 and 70 to share the lead with Japan’s Isao Aoki entering the final round. Nicklaus led Aoki by two strokes with two holes to play, then the Golden Bear sealed his fourth U.S. Open triumph by sinking birdie putts of 20 and 12 feet, respectively, on the 17th and 18th greens. He won with a U.S. Open record score of 272, two shots better than Aoki. After the tournament, Nicklaus pointed to his birdie putt on 17 as the key shot. "The putt on 17 was the kind I had been making for 15 years when I needed it," Nicklaus said. "But it was the kind I hadn't made for nearly two years." Two months after his triumph at the U.S. Open, Nicklaus turned in a steady four-round performance to win his fifth PGA Championship. He opened with a 70 at New York’s Oak Hill course, then followed with a 69 and 66. Although his 66 was the tournament’s low round, a pair of late bogeys permitted Lon Hinkle to draw within three shots entering the final round. But Nicklaus quickly built his lead to five shots after three holes and eight with four holes to play. He finished with a 6-under-par 274 to win by seven shots, as no other competitor broke par. "I guess it might have looked like a dull day to most people, but it wasn't dull to me,” Nicklaus commented after the tournament. Nicklaus continued to play well into the 1980s. His final PGA Tour victory was also his last major victory -- the 1986 PGA Championship. He played on the victorious 1981 U.S. Ryder Cup team and twice captained the American squad, winning in 1983. He joined the Senior PGA Tour in 1990 and played through 2005. His many honors include membership in the PGA Professional Hall of Fame, the World Sports Hall of Fame and the World Golf Hall of Fame. “Sports Illustrated” named Nicklaus the best individual male athlete of the 20th century, and President George W. Bush awarded Nicklaus the Presidential Medal of Freedom in 2005. Which Two Golfers Have Won the Most PGA Championships?